For Joseph Lee, coming to Emory University as a member of the Class of 2020 is the culmination of years of hope and hard work. This week, the University welcomed 1,867 first-year students ready to begin their college journeys. Like the rest of the incoming freshman class, Lee brings with him top test scores and grades, along with the years of community service and athletic and artistic achievement that signal a sense of engagement and drive. The difference is he grew up in nearby Doraville, Georgia, so Emory has felt like home since an elementary school field trip to the Michael C. Carlos Museum. The tremendous variety of incoming students' backgrounds and accomplishments mirrors the breadth of their academic interests in the humanities, sciences and arts. Although they won’t declare majors until their second year, members of the Class of 2020 have announced their interest in studying across Emory's diverse majors, from anthropology, creative writing, history and the classics, to neuroscience, human health and interdisciplinary programs, among many others. 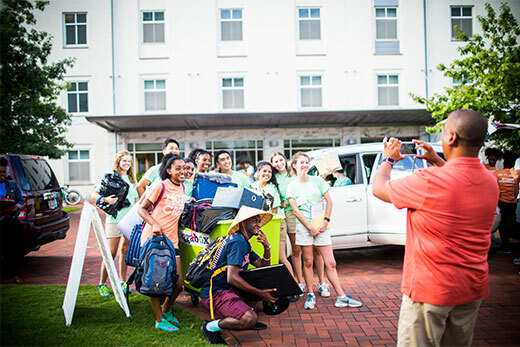 Students choose between two paths when they apply to Emory University: They can begin their studies in the Emory College of Arts and Sciences on the Atlanta campus, or spend their freshman and sophomore years at Oxford College on Emory's original campus in Oxford, Georgia. After their sophomore year, students can choose to complete their undergraduate degrees in Emory College, Goizueta Business School or the Nell Hodgson Woodruff School of Nursing. For the Class of 2020, 1,362 first-year students enrolled in the Emory College of Arts and Sciences and 505 in Oxford College. Total applications for Emory College fell just shy of 20,000, a nearly 13 percent jump from the Class of 2017 — applications rose from 17,681 in 2013 to 19,924 in 2016. Average SAT scores were up 15 points over last year, marking the highest ever for Emory College. Enrolling students come from 46 states and 36 countries. Selecting the Class of 2020, though, extended beyond those metrics to find students who are active learners eager to pursue the knowledge and experiences that come with Emory's liberal arts-focused undergraduate education enhanced with research university resources. “There is a sense you get reading the files, how scholarly, how self-propelled and how engaged our students really are,” says John Latting, dean of admission and assistant vice provost for undergraduate enrollment. “I’m struck by the thoughtfulness of the students, who seem to be motivated by the high ideals of education in their lives and know that they will receive what they value here,” he adds. Incoming freshmen choosing Oxford College display the same enthusiasm and intelligence. Applications for the Oxford campus grew by more than 25 percent in four years. They come from across the United States and 14 countries and will be the largest first-year class in Oxford history. “We saw an increase in the number of students choosing to enroll after being offered admission, an indication that Oxford has continued to grow as a first-choice institution among graduating seniors seeking a personalized, challenging liberal arts experience,” says Kelley Lips, dean of enrollment services for Oxford. “What’s more, the Class of 2020 is among the most diverse we’ve ever seen in terms of the geography, academic interest, ethnicity and socioeconomic composition,” Lips says. Emory also strives to make sure economic barriers do not prevent students from realizing those experiences. Some 54 percent of all Emory undergraduates receive financial aid. Emory remains committed to meeting 100 percent of demonstrated financial need for all admitted domestic students, with programs including Emory Advantage, which provides loan relief for families whose total annual income is less than $100,000. "Opportunities I wouldn't get at any other school"
Daniela Farchi, who is from Guatemala, says she stepped onto the leafy Oxford campus two years ago for a scholars visit and immediately felt at home. She is eager to take on leadership roles, a hallmark of Oxford's small community, and begin exploring classes to decide her major. Lauren Taylor sees a future in public health. But choosing Emory for her undergraduate education was about more than research opportunities and proximity to the U.S. Centers for Disease Control and Prevention. Taylor, a freshman on the Atlanta campus, also worked for her school’s literary magazine and has published one of her poems, so she is especially drawn to the idea of taking classes taught by a former U.S. poet laureate.